Thousands of Stripers not wanting to eat. In this screen shot I had caught bait and was running back to the marina to pick up my clients. I noticed a bunch of fish stacked up on a contact point adjacent to a feeding flat. 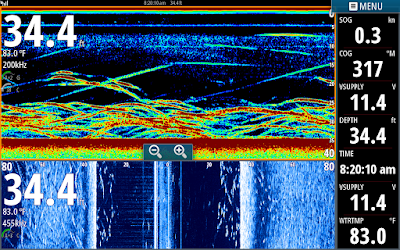 This is a classic example of how Largemouth Bass and Stripers work in the summer months. They both use contact points [areas of a large flat that have a lot of definition nearby a channel] to congregate prior to moving up onto the flat where they spread out and feed then they use the same contact point to get back together after feeding to group back up and move off the flat to suspend till another feeding session. I did not have to pick my clients up till 6am so I waypointed the spot and went back to it. I dropped two herring down to 18 feet and hooked up with two 3 to 4 pound Largemouth. When I was a Basshole I would check 20 to 30 contact points a day trying to catch the bass congregating and when I did 5 casts later I would have a limit. I would use a weighted DB3 that I drilled under the bill and filled with lead to get the bait to run deeper. 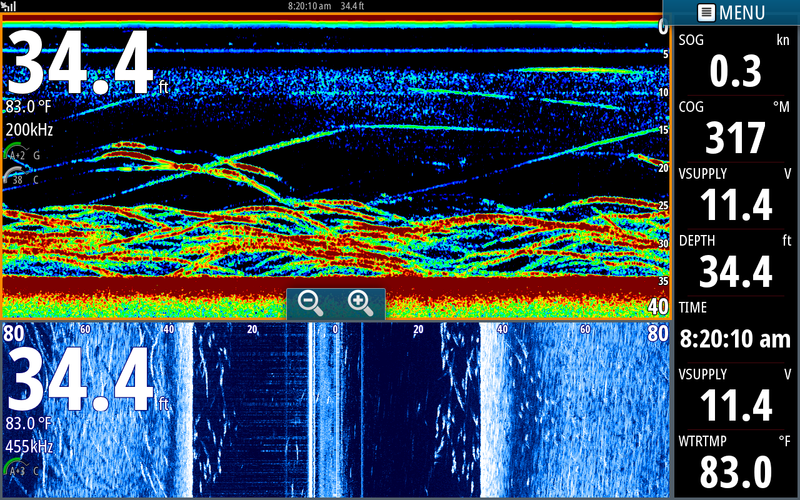 When the Bass would pull off the point to deeper water they would suspend in the same depth. Sometimes I could pull off the point as well and catch the suspending bass once I relocated them. Anyway I was hoping these fish might have been Stripers to put my clients on first thing that morning but that wasn't the case. This was the first school of Stripers I located in the morning. This was the tail end of the school where most of the punks were. There were hundreds if not thousands of fish in the school but I could not find the front of the school where the more aggressive Stripers would have been. This is just another shot of the school while I was looking for larger fish. 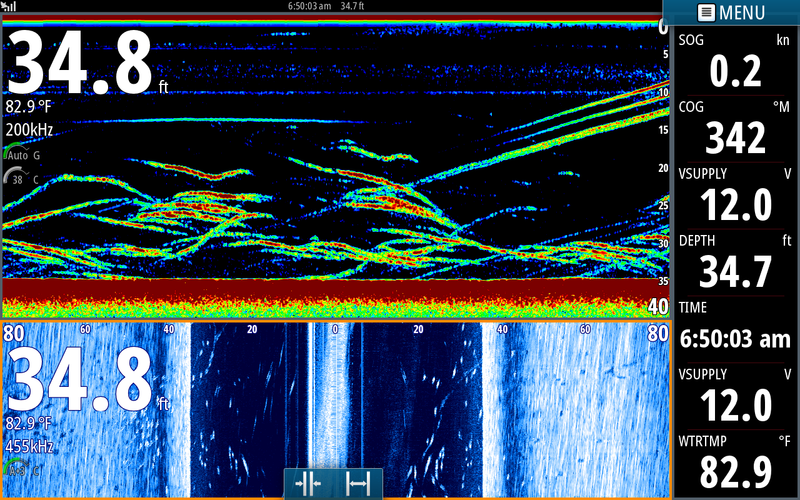 Here I had located another school of Stripers and was using my side scan to look for the larger fish. We were catching fish here but mostly punks. The fish were not active at this point. 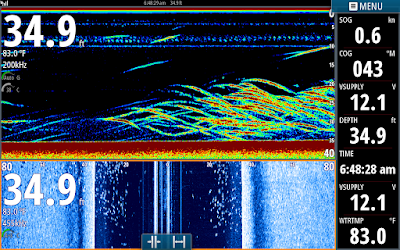 I continued to look for more aggressive and larger Stripers until I found what you see in the pic below. I found the lead pack of the school which were noticeably larger fish. If you look to the left of the side scan screen you can see the larger vertical dashes compared to the smaller ones on the right of the screen. It doesn't take a genius to steer the boat to the left to get on the nicer fish. 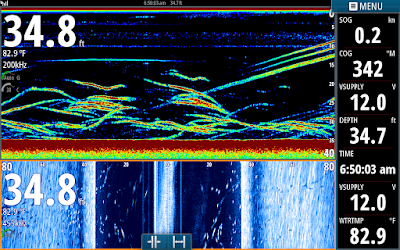 We caught four or five nicer Stripers there but the fish were still not active [no streaking and very compressed in the sonar page] and by then 5 or 6 boats had seen us catching fish and has moved in on us with their big motors spooking the school even more. I left these fish to find other schools with no boat traffic in hopes of catching non pressured schools. 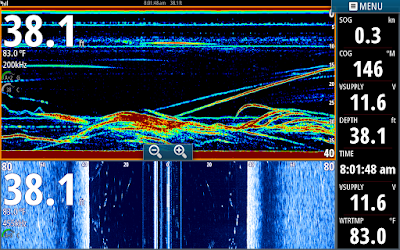 Stripers do not like fishing pressure and especially do not like Barometric Pressure changes. A cold front had moved in lowering the water temp a degree or two but the Barometric Pressure climbed significantly enough to shut them down. When you see so many fish like there are in these screen shots and you put your baits in their faces only to catch punks and Catfish it is time to move on. When nicer Stripers are feeding they will not allow a punk or Kitty to eat. The move paid off for us and we caught a 10 pound Striper and numerous other keepers. Good Electronics are the key to success on lakes in the summer months. Understanding how to set them up and how to interpret what you are seeing are the keys to utilizing their potential to the fullest. 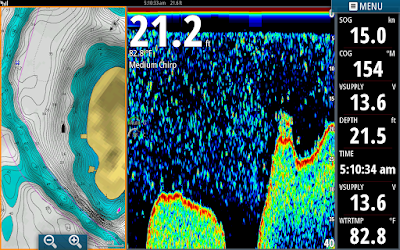 Simrad and Lowrance are the best money can buy. They make the difference in fishing or catching! All I got to say is thank God for Jim Hemby and this daily journal! The screenshots and explanations are priceless, please keep them coming! My wife and I caught today(Sat) our two largest stripers to date on lake Anna, largest measured 29". I bought an hds7 gen3 from Greentop 2 weeks ago with Jim's and Steve's(manager)help. I just tried it out today and I got to say we have gone to another level of fishing. The Navionics card is wonderful, no more snagging the bottom if you are watching the contour lines. And I can finally see some fish! Thank you Jim and the crew at Greentop for being so kind and helpful, keep up the good work! Also want to say that we booked a trip last summer with Jim and we ended going out with Tony because Jim was busy and we had a great time. We caught around 40 fish! Question for Jim: last night we had a very bright full moon and the bite was definitely slow today(sat). I read what you said about barometric pressure, do you also think that the stripers may have fed last night because of the extra light? Mr, Todd you are too kind. 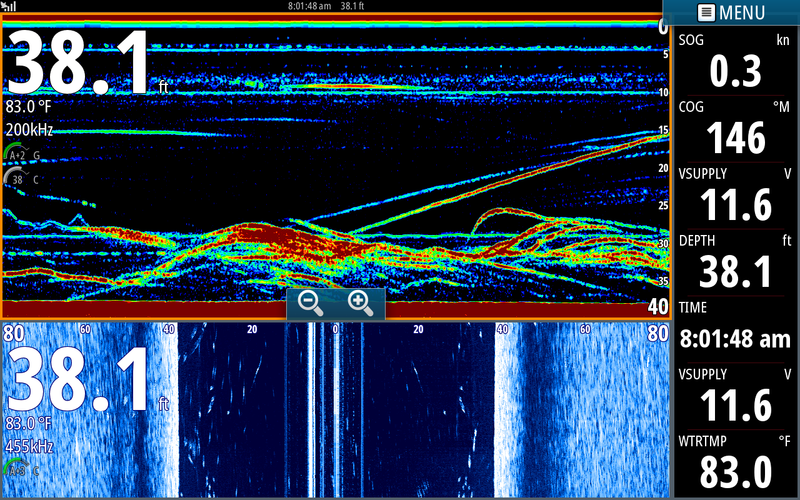 Regarding fishing the day after a full moon, yes if the moon was bright that is the perfect light for fish to feed and they were probably full the morning you fished. Even in June and July when we catch 100 to 200 fish a morning the full moon affects the morning bite. Sometimes the fish won't bite till 10 or 11am. I will entertain your suggestion for a forum only if there is enough participation from the fisherman. My slow time is coming up and I may have time to set it up and work it. If anyone wants to do it and I get a proper response I would be happy to do it. I post my screen shots for my clients so that they can understand what they are seeing and and to take advantage of their depth finders. You all spend the big bucks to buy them, I want to make sure you know how to use them once you have them on your boats.